With the New Year being just a few days away, I’m taking the time to reflect a lot on myself and start making resolutions for 2016. Looking back on this year, it has definitely been a busy one, which leaves us all neglecting ourselves in some way. I have done a great job at being healthy; however there are some areas that I would love to improve on – starting Friday! Self-improvement is key in my book since you should always be trying to better yourself and keep your level of happiness high. Take the time to reflect on what you feel you have been lacking this year and make a list – there are your 2016 New Year’s resolutions. Incorporate Healthy Fats – I’m a big believer in healthy fats, I just don’t necessarily eat them as much as I should. Examples of healthy fats include coconut oil, avocado, almonds, and salmon. My all-time favorite is coconut oil, which is super easy to use. You can use it in a pan to stir-fry vegetables, make eggs, and even bake! 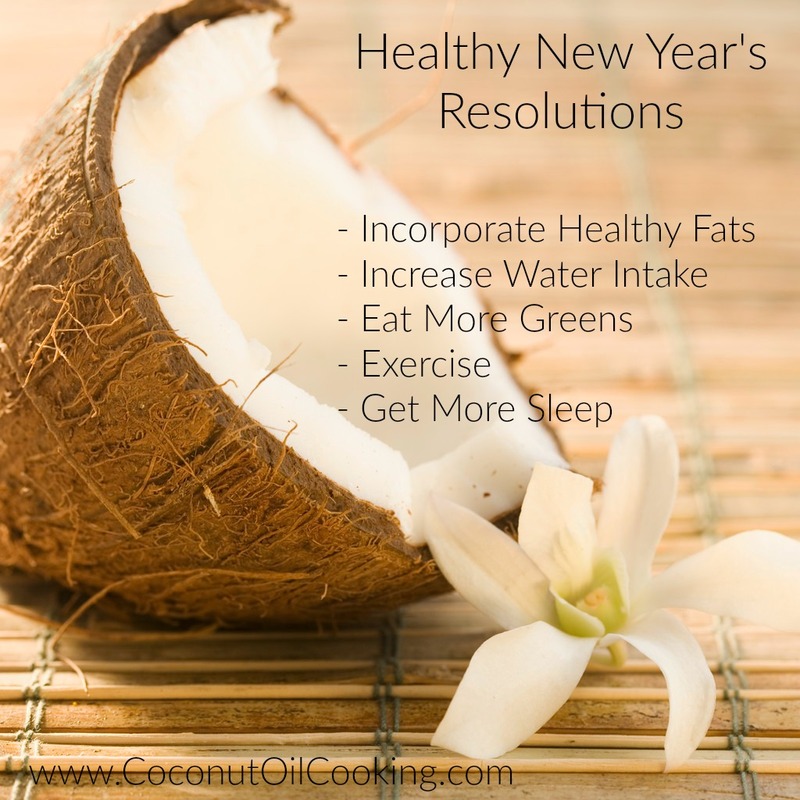 Coconut oil is a plant-based saturated fat, which contains medium chain triglycerides. These medium chain triglycerides, or MTCs, are absorbed differently than butter or olive oil. Instead of being stored in the body as fat, the coconut oil is utilized as an energy source, which is great for early mornings! Be sure to purchase an unrefined, Organic extra virgin coconut oil, which still has all the natural health benefits. If baking with coconut oil, simply replace the recipe that calls for butter/oil with coconut oil in a 1:1 ratio. Drink Up – For the longest time, I made it a goal to get at least a gallon of water in per day. Sometimes this didn’t go as planned and I really started to get bad about my water intake, especially toward the Holidays. Water consumption is so important for helping transport nutrients to the body, regulate body temperature, and digestion. Along with these benefits, drinking water will also help you feel fuller, longer. My best advice is to keep a gallon with you at work and fill that water into a cup. This way, you can keep track of your water intake and see your progress! Eat Your Greens – I have my good and bad weeks when it comes to incorporating vegetables into my diet and this is one thing that definitely shouldn’t just be pushed on children. It’s important for adults to have an adequate intake of healthy greens as well. Go back to the basics of nature when it comes to choosing your veggies, including include spinach, kale, chard, arugula, broccoli, bok choy, collard greens and bell peppers because of their high vitamin and fiber content. Exercise – I love to exercise and try to make it a daily routine, but we know that things don’t always go as planned. It’s my new goal to try to make it to the gym at least 4-5 days per week for 2016, even if it’s just to do some HIIT cardio. Exercise is great for keeping your body toned and relieving stress levels – I may not always want to go, but I sure feel better once I’m done! This 10-minute core workout is also great for home if you’re not able to make it to the gym and be sure to drink a protein shake right after you work out for muscle recovery. Lots of Sleep – A lot of us may not take the time to get the right amount of sleep that is needed and I’m fully guilty of this. Sleep is so important for the body and mind, which makes it essential to aim for the following targeted hours (according to the NSF) – younger adults (18-25) 7-9 hours and adults (26-64) 7-9 hours. I’m taking initiative to turn the TV off once I’m in bed and put the cell phone down so there are no distractions. Now that I have a list down, I’m also going back to my own tips on ways to start and keep healthy habits – perfect for the 2016 year! Make this one a happy and healthy one!